There is a new book out on Leonardo De Vinci by Walter Isaacson. It is not a book to be devoured but savored. 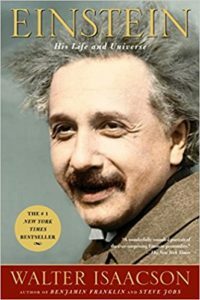 I was taken by the comparison with another subject of Isaacson’s, Albert Einstein. Their commonality is in their life-long gifts of wonder and curiosity. They both saw the ordinary in a different way. They wondered how things worked and how they came to be like no others. God’s gift of wonder is not limited to genius. All one has to do is watch a young child explore his/her hands and feet and marvel. Give a child a new toy and if it can be disassembled it will be before one can turn around. I used to drive my mother crazy because I wanted to know how things worked so I would tear my newest toy apart to discover how it worked. Although we may drive that sense of wonder out of our children over time, it is never too late to reaquire it. In fact, age gives us the time to appreciate how things work, grow, or adapt. Take a few minutes out of your day to wonder and be curious, it is God’s gift that keeps on giving the longer one lives. Next Post: An Assurance of Safety and a Temper of Peace.